With accelerating trends such as climate change, water scarcity, energy depletion, social injustice, economic crisis, resource wars and other challenges, there is a growing need for sustainable alternatives. This course connects guest lectures that describe the severity of the challenges and workshops that discuss the possible sustainable responses and solutions to those challenges within the context of a specific global city and region. Students will have the opportunity to link global challenges to their own local and cultural backgrounds. 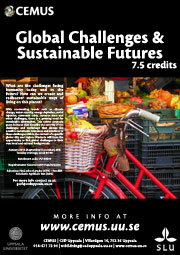 We are looking forward to 'Global Challenges and Sustainable Futures 2014'! At the moment we are working hard with the last details before we start the course in September. Please keep checking this course portal for the latest updates, soon we will post the preliminary schedule and additional information regarding course literature.